Graeme McDowell splashes out on the opening day of the US Open at Congressional Country Club. 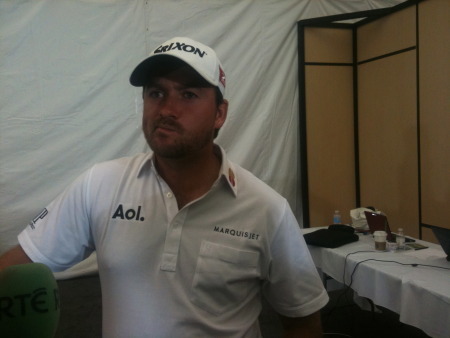 www.golffile.ieGraeme McDowell made a super start to his US Open defence but confessed that golf was put in perspective as he saw a spectator fight for his life. The Ulsterman was delighted to fire a one under 70 that left him just two shots behind clubhouse leader YE Yang of South Korea. But he also took time out to spare a thought for a fan who suffered a heart-attack as he was playing the tough, uphill 11th. Paramedics worked frantically to revive a 30 year old man and McDowell had to put the horrific scene out of his mind as he followed two birdies and a bogey in his first six holes with 12 straight pars to finish. “Someone obviously were having some problems over there and that puts things in perspective for you,” said G-Mac, who finished the day five shots behind pal Rory McIlroy. “You’re out there trying to do your best, but it certainly puts golf in perspective when you see someone obviously fighting for their life. Bidding to become the first player to successfully defend the title since Curtis Strange in 1989, McDowell felt he put his momentuous year behind him last Sunday night. After opening with a 70 for the second year in a row, he said: “The weight was off my shoulders Monday morning. Something happened when I was here on Sunday night. And I felt great on the golf course Monday. And I felt good out there today. Graeme McDowell (NIR) teeing off on the 1st tee.on day one of the USGA at Congressional country club, Bethesda, Washington, 16/6/11.Picture Fran Caffrey/www.golffile.ieWith a light raining misting the course from 7 am, the course was set up for low scoring but McDowell didn’t feel he had failed to take advantage. He said: “I don’t think you ever feel that way at a US Open that you’ve got to go out and make a score. You just try to take each hole as it comes. “The golf course changed dramatically as the round went on. The wind got up on the back nine there and holes like 15 and 16 played different than what we saw in practice. The Portrush star got an early wake up call when he bogeyed the par-four first after two visits to sand. But he birdied the 217-yard second after a searing rescue club to six feet and settled down for the rest of the day. A birdie at the par-five sixth, where he was talked out of going for the green in two by his caddie, saw him move onto the leaderboard at one under. And he stayed there for the rest of his round as he finished with 12 pars in a row thanks to some excellent par saves. Graeme McDowell (NIR) playing his second shot from the bunker on the first on day one of the USGA at Congressional country club, Bethesda, Washington, 16/6/11.Picture Fran Caffrey/www.golffile.ieThe pick of them came at the 199-yard 10th, his opening hole, where he almost holed his recovery after seeing his tee shot trickle into the back bunker. Never a fan of that hole, McDowell said: “I think 10 is maybe the only slightly unfair hole, here, at Congressional. You know, it’s a tough number for me, especially today. “Five iron was barely beating front edge. I had to sizzle a five there and four was kind of too much for me today. It was a tough number for me. McDowell was playing with Open champion Louis Oosthuizen who finished with a two under 69 to finish a shot behind clubhouse leader Yang. But while McDowell was just a shot behind the South African, they got even closer when their lay-ups at the 636-yard in finished touching one another. McDowell said: “We laid them up from about 220 yards and the two balls were touching in the fairway, which I’ve never seen on the golf course before. It was pretty incredible. Yang birdied all four par-threes as he fired a three under 68 to lead by a shot from Oosthuizen and American Ryan Palmer with McDowell’s 70 leaving him alongside US Ryder Cup skipper Davis Love III Chez Reavie, Stewart Cink and Swedish pair Henrik Stenson and Johan Edfors. But it was a day to forget for the world No’s 1, 2 and 3 as Luke Donald shot 74, Lee Westwood a 75 and Martin Kaymer a three over 74. Yang has missed the cut in his previous two US Opens and never broke 73 in four rounds. Graeme McDowell believes he has momentum on his side as he bids to deny Tiger Woods and Phil Mickelson in the US Open. Graeme McDowell breathed a sigh of relief when he discovered that Congressional is not the monster he once feared. The defending champion was beaten up by the 7,574 yard beast when he played it in damp conditions early last month. Six weeks later it’s playing faster and firmer and McDowell reckons he’s now got a realistic chance of defending his title in what he believes will be a wide open US Open. Graeme McDowell insists he’s ready to get on with the rest of his career after a sensational year as US Open champion. The Ulsterman believes handing back the trophy has lifted a huge weight off his shoulders. And after admitting that his game “hit a brick wall” a few months ago, he’s looking forward to breaking through to the other side and contending for major No 2 this week. Jim Furyk and Graeme McDowell on the 14th green during Thursday’s opening round. 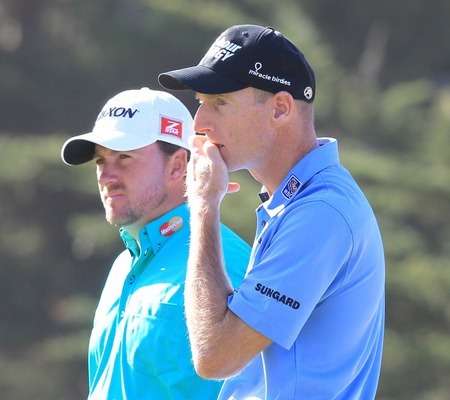 Photo Eoin Clarke/www.golffile.ieGraeme McDowell produced a series of clutch par saves, then played his last nine holes in three under par to grab a share of the lead with Jim Furyk entering the final round of the US Open at The Olympic Club. Webb Simpson survived a late scare from Graeme McDowell to win the US Open. Photo Eoin Clarke/www.golffile.ieGraeme McDowell produced a gutsy fightback but watched in agony as his 24 foot birdie putt on the 18th slipped by the hole and allowed Webb Simpson to breathe a sigh of relief and lift the US Open trophy at a foggy Olympic Club.